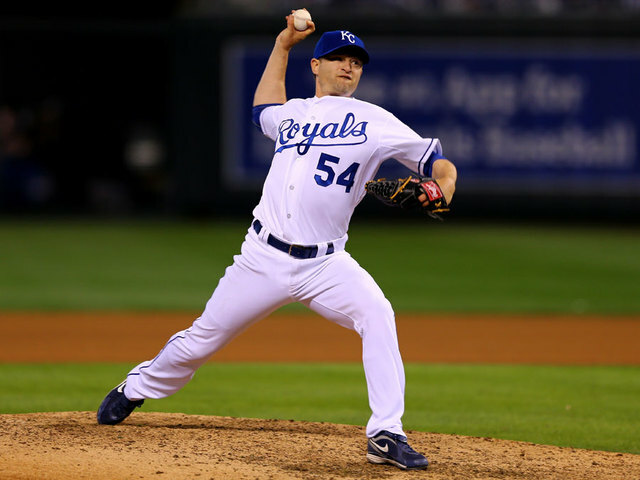 Traditional stats say that veteran right-hander Jason Frasor is having an effective season out of the Kansas City Royals bullpen. According to Sabermetrics, he is struggling. Based on the the latter, the Royals designated Frasor for assignment on Monday to make room on the active roster for outfielder Paulo Orlando. The 37-year-old Frasor was a key member of a Royals bullpen that was pivotal in the team’s American league pennant last season. He posted a 1.53 ERA, a 0.96 WHIP and a 4.0 strikeout-to-walk ratio over 23 appearances and 17.2 innings after he was acquired from Texas on July 16. Frasor allowed one run and five hits in 5.1 post-season innings. This year, Frasor owns a 1.54 ERA in 26 outings and 23.1 innings, but he also carries a 1.67 WHIP, a 1.2 strikeout-to-walk ratio, a 4.03 FIP, a 4.60 xFIP and a 4.71 SIERA. Simply put, Frasor has demonstrated erratic command. Last offseason, Frasor inked a one-year, $1.25 milliondeal with the Royals that includes a 2016 mutual option of $2 million or a $550,000 buyout. Kansas City features a deep bullpen that includes Kelvin Herrera and Wade Davis, who were named American League All-Stars on Monday night. Closer Greg Holland, swingman Brandon Finnegan and veterans Ryan Madson, Franklin Morales and Luke Hochevar are also part of the relief corps. Considering Frasor’s proven track record over a mostly successful 12-year Major League career (3.52 ERA, 3.74 FIP, 8.6 strikeouts per nine innings), and his 1.54 ERA this season, likely a contender will take a gamble on Frasor and work on solving his command problems. The Minnesota Twins expressed interest in Frasor last offseason, and they are working on upgrading a shaky bullpen, so they are one possible destination for the right-hander who has pitched for Toronto, the Chicago White Sox, Texas and Kansas City.